Dirs. Lucien Castaing-Taylor & Verena Paravel, 87 min., Netflix Disc. 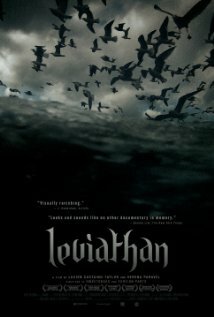 For a documentary, you don’t learn all that much about the crew of the commercial fishing vessel profiled in Leviathan or the commercial fishing industry in general. While there are gritty and (sometimes) repulsive images of the detritus fauna leftover from the select bounty of the sea that humans will purchase in their local supermarket, it is neither placed in context by a Godlike voiceover, nor explained through visual imagery. What we are left with are a series of disjointed scenes from the boat, a boat where apparently no one talks to the cameraman shoving a lens in their face or to each other (except on very rare occasions when there is a problem). While many of the visuals are stunning, just as many are monotonous or indecipherable. My experience watching on a DVD at home may take away some of the majesty of watching an upside-down shot of seagulls in flight lasting fully five minutes, but I can’t imagine it was much more stunning on the big screen. I’ll put it out there: I don’t need for films to have dialogue or to particularly make sense, but I do need to feel some aesthetic response to what I’m seeing. Those moments that resinated with me from Leviathan involve workers adeptly performing monotonous tasks at breakneck speeds. I can relate to that quite a bit more than most people may ever know. I think the directors were trying to use these long takes to make the viewer empathize with the combination of monotony and freneticism that these workers experience daily, but looking at the thing in this case won’t necessarily build empathy; and if you already sympathize, you only have to look at it for about 60 seconds to fully appreciate it, not ten minutes. I think it’s easy to see where I’m going here: the film needed to be 50% shorter. The endless dark frames of underwater photography with indecipherable images and unintelligible sound design were tedious. Culled moments, like the sailor slowly falling asleep to some popular reality fishing show (clearly the antithesis of the directors’ artistic vision), if edited properly, could have made this documentary that much more powerful. Now let me go back on everything I said in the last paragraph. If the film has a purpose to me, it’s that the human mind is always looking for form, and the extreme close ups and water-obscured lenses rarely give the human mind what it wants, such that when you do see an image, it strikes you in a way that would not be possible if not for the longing for form that preceded it. The title remains somewhat of an enigma: is it representing man as the biblical beast? Perhaps a clever retort to Hobbes’ book of the same name? The loving dedication to those men and ships lost at sea during the closing credits suggests a more simpatico viewpoint, but the film seems to thrive on its mystique rather than its substance.